And this book is a true beauty. Beautiful pictures, great crust-making tips (with large pictures showing the texture you should be looking for), an introduction about their beginnings, family business and the start of their pie shop, and a detailed yet comprehensive discussion about ingredients, sourcing them, and tools. I also really appreciated how their belief in using local, seasonal ingredients is inherent in how they decided to structure their book. 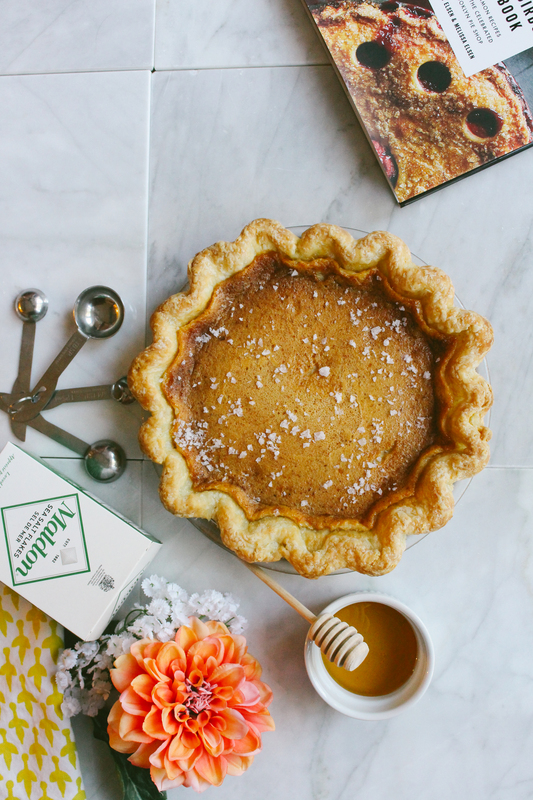 I usually tend to tinker with recipes, but this one I followed it to the T (with the exception of reducing the sugar by 1/4 cup, which was the right decision), because I regrettably am not able to visit their pie shop in Brooklyn… so I wanted to make it and eat a slice and pretend I’ve traveled 152385.7362 miles to their shop. I also wonder how close it would be to their pie… you would figure that bakeries would keep their own recipes secret, but I think technique is above all the most important “ingredient”, and it’s the reason why there’s no reason to fear going out of business or anything. 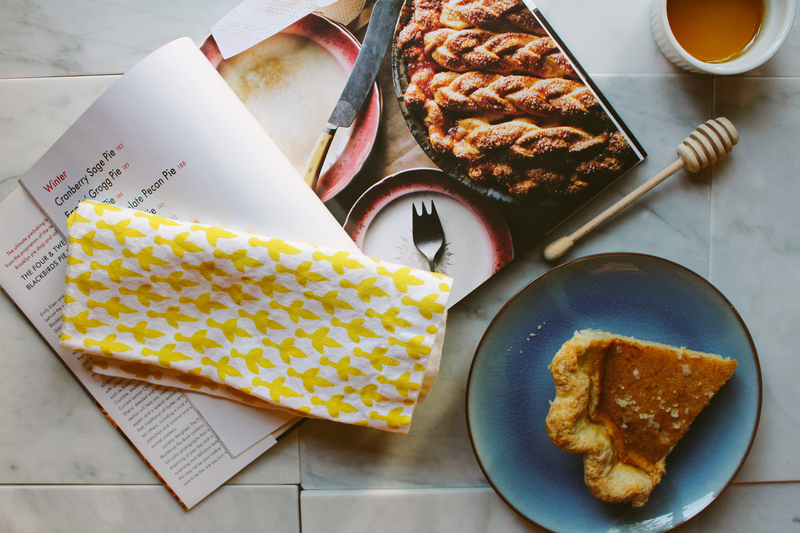 To be able to replicate their pie crust– it’s all in the technique. 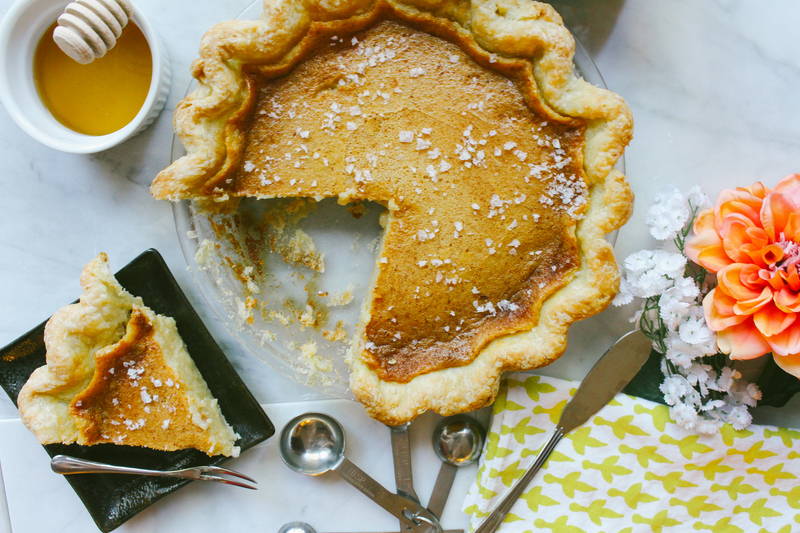 Pie has always been scary to me– it’s technical and mysterious in the way that many swear by a specific fat or using a combination of fats, or they have secrets and add things like vodka or an egg yolk or vinegar. It’s so scientific you could probably do a whole science fair project on it. 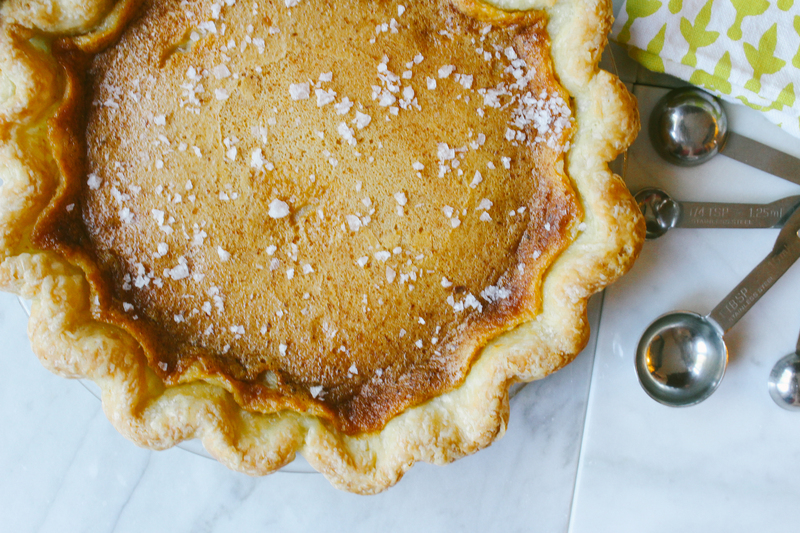 In the past, my downfall is adding too much water, so that the resulting crust is neither tender nor flaky. 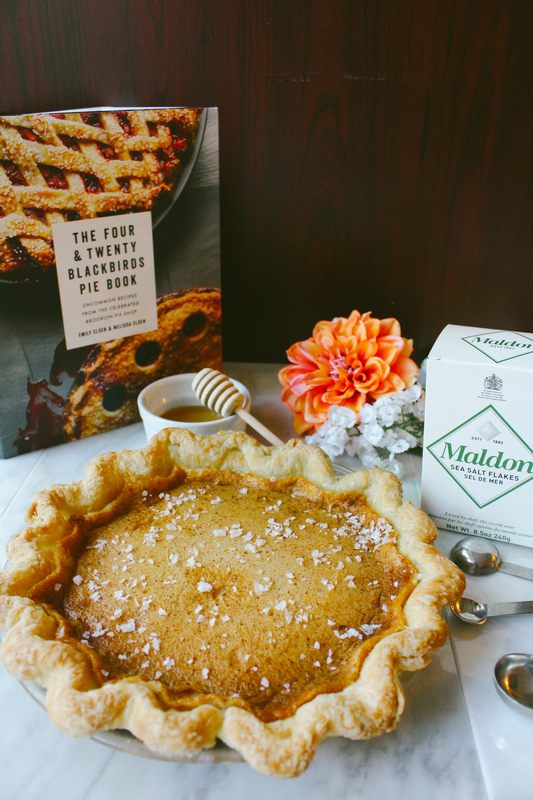 I’m not going to pretend that I am a pie expert, but I will summarize some tips I’ve picked up from the Blackbirds cookbook, Michelle over at Hummingbird High (eternally grateful for her super awesome detailed, specific tips) and King Arthur Flour’s awesome article. I like that this method divides the work up over two (or more) days, which makes it feel like it’s a lot less work, and everything really comes together in a snap. 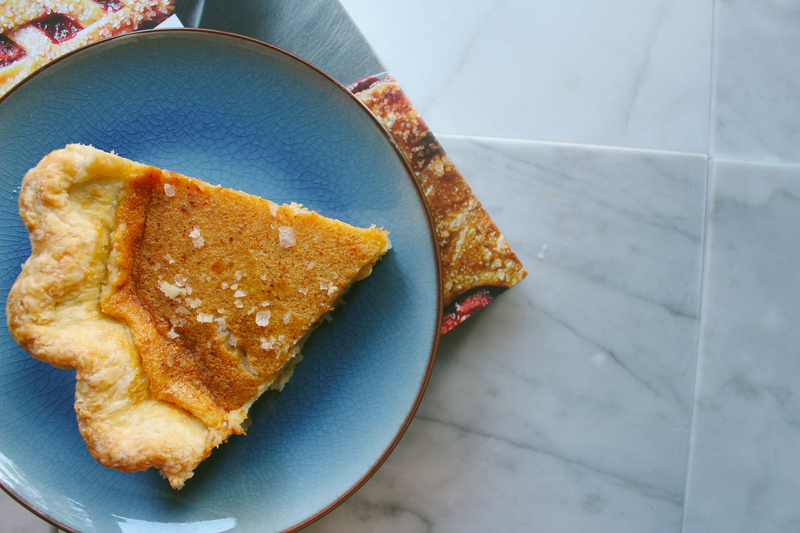 Everything needs to be cold when you make the crust. The night before, chop up your butter into 1/2-inch cubes and freeze in an airtight container. Measure out the dry ingredients (flour, sugar and salt) into a large, metal bowl, cover it with plastic wrap, and place it in the fridge. Make ice cubes if you don’t have them readily available. Measure out 1/2 cup of water and put that in the fridge too. Place any tools you might be using (eg. pastry blender) in the fridge as well. The next day, when you’re ready to make the crust, have all your ingredients fresh out of the freezer or fridge, and be at the ready. Combine the ice, cold water, and vinegar. Toss together the dry ingredients and frozen butter to give everything a good mix. 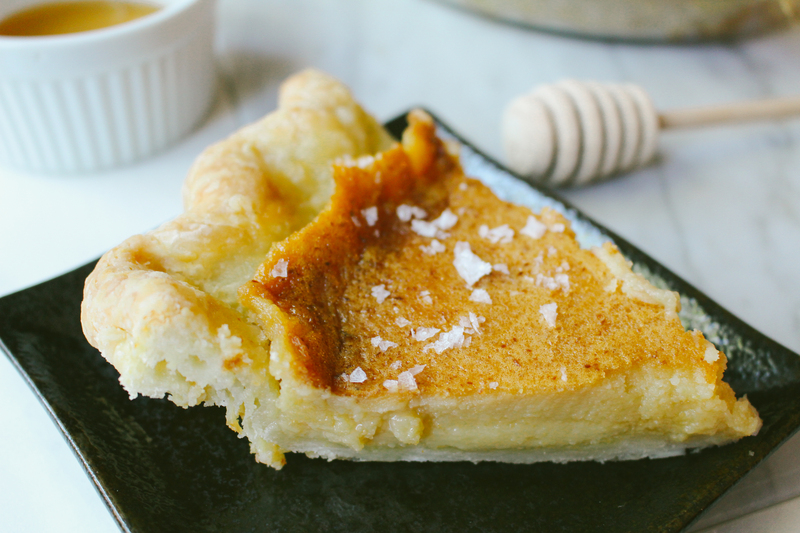 Using the pastry blender, cut everything together until it reaches a cornmeal-like consistency, with a few small chunks of butter. Add the ice water vinegar mixture, 1-2 tablespoons at a time. Please not that you WILL NOT use all of it. Add enough until the dough sticks when you squeeze it together. It should be clumpy, but there should still be dry pieces remaining. That’s okay. You want to work with the dough minimally, no kneading or anything like that. The butter should be marbleized through the dough, with streaks and not huge chunks. Wrap the crust in plastic wrap and rest it for an hour at least, before rolling it out. When you’re ready to roll, let the dough sit out of the fridge for 5-10 minutes. Generously dust your surface, rolling pin, and hands with flour– you can always brush off excess flour off the dough with a pastry brush after! Roll the dough 2-3 inches bigger than the pan. Transfer it into the pan (either by folding it into quarters, then unfolding it in the pan, or transferring it using the rolling pin). Trim it using kitchen shears so the overhang is approximately even all the way around, but try to leave as much dough as possible, because that will help with the dramatic crust. Use it to patch up any holes, if needed. Roll the overhang under, creating a cylinder. Then, crimp your edges, using the thumb of one hand, and the index finger and thumb of the other to create the pattern. Freeze the crust (tightly wrapped in plastic wrap) for at least 3 hours, and up to a month before using. 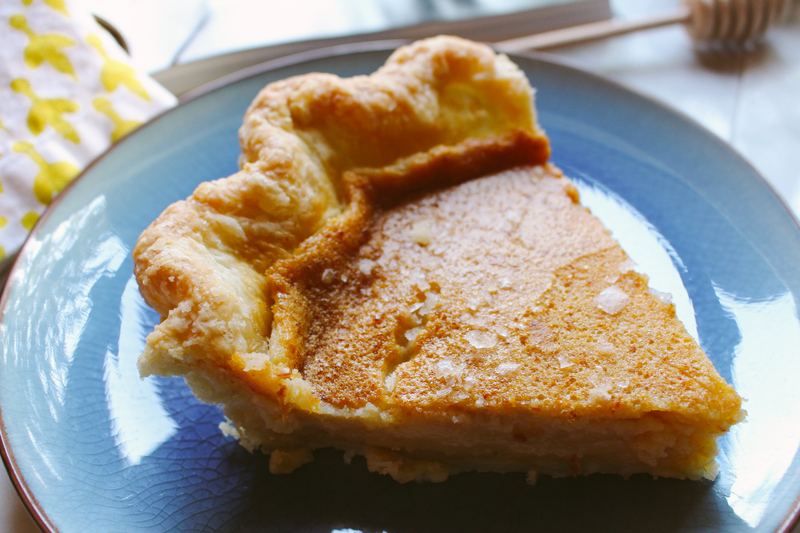 And a note about custard pies from the pie book– it’s important to take them out of the oven at the right time, because if you take it out too early, it’ll be underbaked and runny, and if you leave it in too long, it’ll be overcooked and curdled. As it’s finishing, you’ll notice the outer 2 inches of the custard will look set, puffed up slightly, and when you shake the pan, only the centre will jiggle a bit and be barely set, but will be moving as one. It’ll still continue to cook in the pan once you remove it. I noticed a small crack in the custard on my pie and I panicked, thinking about the horrors of curdled pie, so I removed the pie. It’s not as golden brown as you see in some other pictures of the Salty Honey, but I actually preferred it this way, because the custard was on the softer and more fluid side, reminiscent of an egg tart. 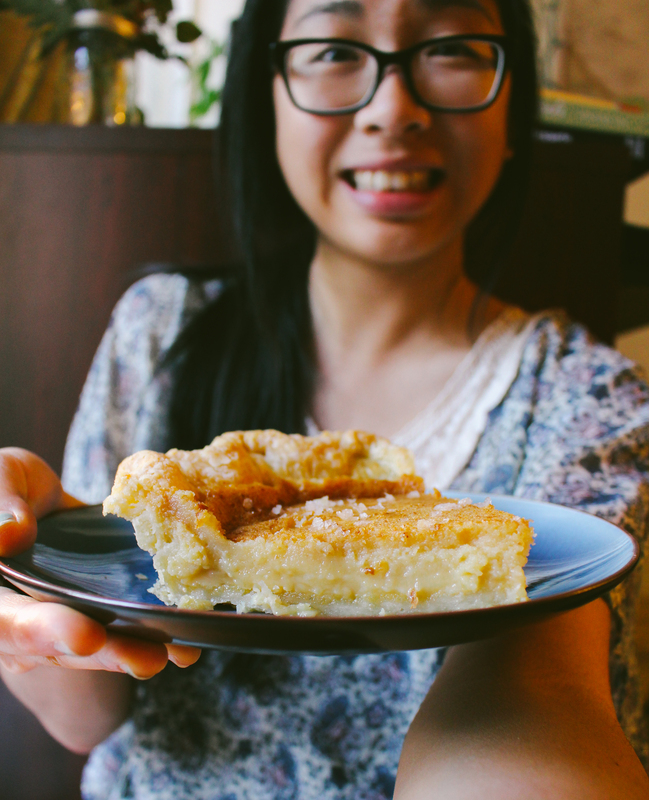 The verdict for this pie? With the first bite, I understood the hype… so this is what people are talking about. The pie crust actually turned out pretty well, except it was still soggy at the interface of crust-and-custard, but since it’s baked together with the custard (no prebaking), the only way I see going around that would be to sprinkle some graham crackers or something to act as a divider between the crust and custard filling. Who knows. 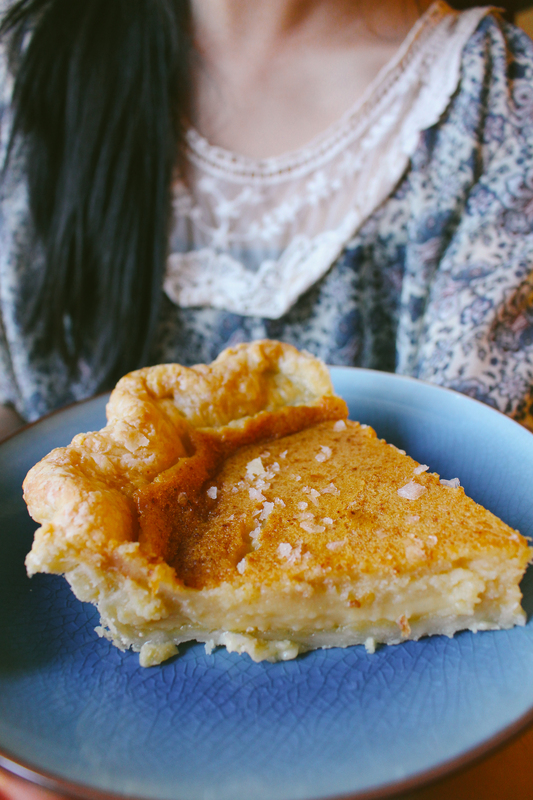 Salty Honey Pie. One bite and everything will be right in your world. Stir the flour, salt and sugar together in a large bowl. Add butter, coat with flour mixture, then use the pastry blender to cut the butter into the flour mixture. Work quickly, and cut until the butter is pea-sized, leaving a few larger pieces. Combine the water, vinegar and ice in a large measuring cup. Sprinkle 2 tablespoons of the ice water mixture over the flour mixture and cut it in until fully incorporated. Keep adding the ice-water mixture, 1-2 tablespoons at a time, until the dough comes together in a ball when squeezed, with some dry bits remaining. You’ll need anywhere from 4-6 tablespoons of ice water-vinegar mixture. I found myself needing more, ~8 tablespoons. Shape the dough into a flat disc, wrap in plastic, and place in fridge to rest for at least 1 hour. You can refrigerate the dough for 3 days of freeze it for 1 month. Roll, shape, crimp and freeze the pie crust, as instructed above, or how you usually do it. Position a rack in the middle of the oven and preheat to 375F. 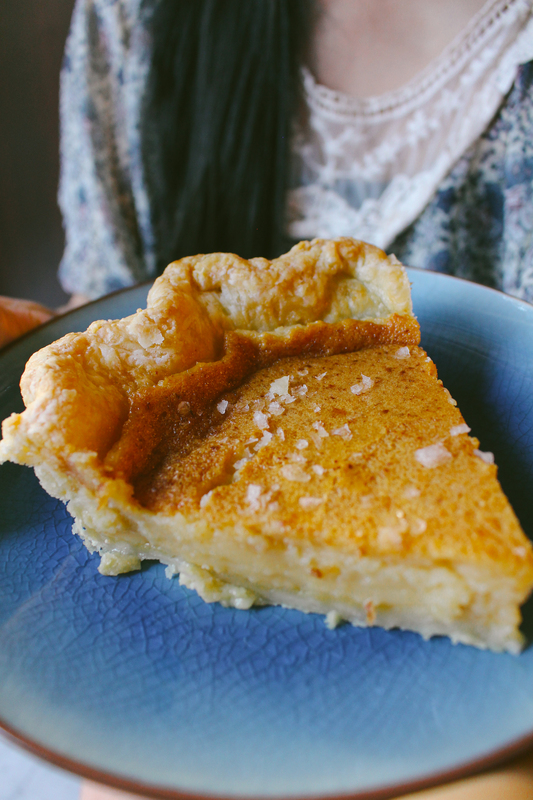 In a medium bowl, stir together the melted (cooled) butter, sugar, cornmeal, salt and vanilla paste. Stir in the honey and eggs one at a time. Then, add the heavy cream and vinegar. Stir to combine. Place the frozen pie shell on a rimmed baking sheet, and strain the filling through a fine-mesh sieve directly into the pie shell. Bake for 45-50 minutes, rotating 180 degrees when the edges start to set, about 30-35 minutes through baking. Mine was ready after 46 minutes. The pie is finished when the edges are set, puffed up high, and the centre is no longer liquid but looks set. It should be golden brown and lovely. Allow to cool completely on a wire rack, 2 to 3 hours. Sprinkle with flake sea salt. Serve slightly warm or at room temperature. The pie keeps refrigerated for 4 days or at room temperature for 2 days.